And press ↩ for the results. So x = -3 or x = 1. You can express the equation differently. Usually you have to expand the terms to get x² + 7x + 14 = 0. Not anymore — Magic Number can do that for you. You will find this easier especially for cubic and quartic equations. Here is a different type of equation. To solve, we need to do some algebra. With Magic Number, you can skip the algebra. This equation has 4 complex roots. 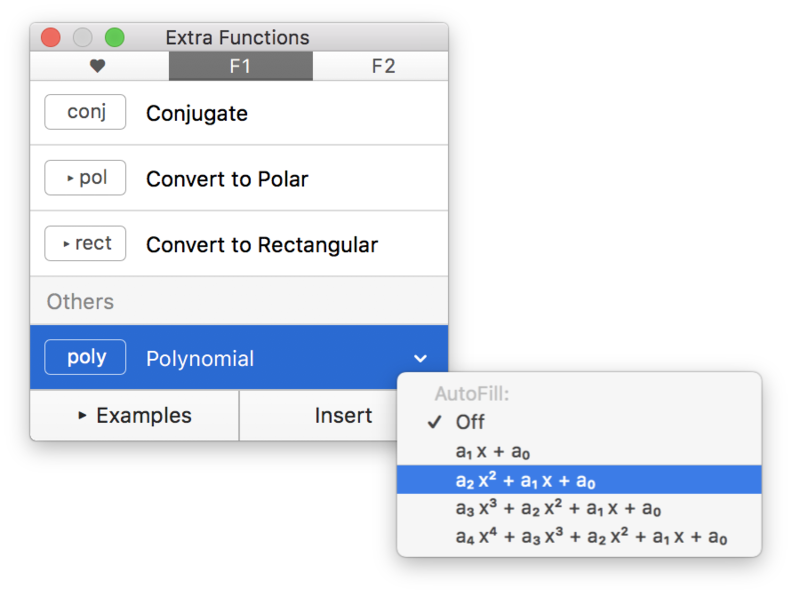 The polynomial function lets you solve equations by providing the coefficients. It is at the end of the list. When you insert the function, its arguments are populated. Tip: You can advance to the next value by pressing tab. To reuse 10, you can press the result button. Magic Number remembers 5 most recent results. You can access them by pressing the button until its menu appears. And when you have a cubic equation, its results can be accessed the same way. If you prefer the keyboard, you can press R for result. And by pressing R repeatedly, you access the next one. 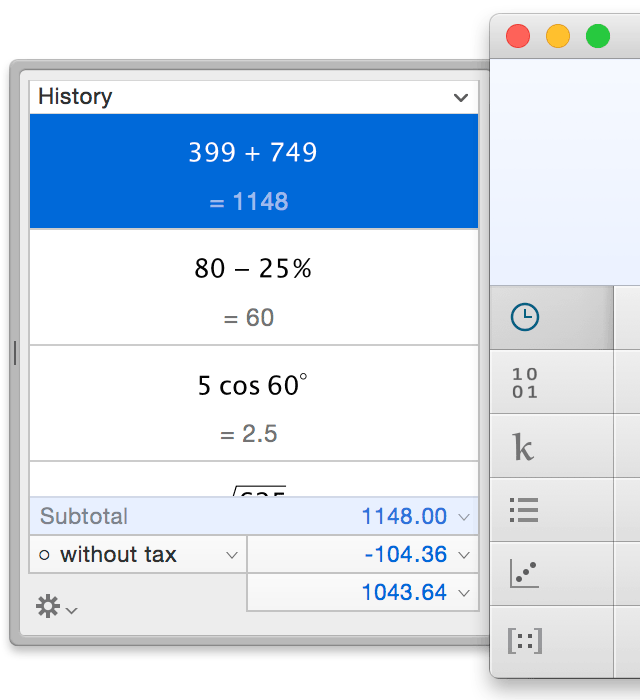 For results in the History, you can control-click (or secondary click) the equation. ♥︎ If you love Magic Number, please rate it. It helps a lot. Thanks! For the love of combinatorics, the factorial button ! is now multifunctional. By convention, factorial of 8 is written as ‘8!’. Previously if you enter ‘8! !’, Magic Number interpretes it as ‘(8! )!’, that is, factorial of factorial 8. But by convention, ‘8! !’ is the double factorial of 8. n!! = n × (n-2) × (n-4) × … × 3 × 1 for n is odd. And of course you can calculate triple factorial and beyond. While factorial is related to permutation or arrangement, subfactorial is related to derangement. Its notation is ! n.
3 things you can do with dates. Let’s start by finding which day of the week is Christmas 2018. Press return for the result. Magic Number’s date format is year.month.day. It is based around the international standard ISO 8601. How many days are between 14 February 2019 and 25 December 2018? For example, '18 . 12 . 25 is equivalent to 2018 . 12 . 25. The single quote represents the ‘20’ in ‘2018’— you can think of it as the current century. But there’s more. The single quote is actually the current shortcut — it gives you the current century, year, month, or day. To illustrate, suppose the current date is 2019.2.14. Enter ' for the current century abbreviation ( ’ ). Enter ' again; this time you get the current year. You can omit the day. For example, ’19.7 is treated as the start of the month, that is, ’19.7.1. You can omit the day and month. ’19 is the start of the year 2019 or the New Year, that is, ’19.1.1. If your Mac uses the comma ( , ) as a decimal mark, then the dot ( . ) is solely for dates. Here you can omit the current year. You can enter .12.25 instead of 2019.12.25. Some math involves gigantic numbers — numbers so large that they can easily overflow calculators and spreadsheets. Previously Magic Number could stumble. Now it just marches on. Useful in computer science and cryptography, modular exponentiation is the calculation of aᵇ mod m, where a, b, and m are positive integers. For example, 5² mod 7 = 25 mod 7 = 4. The modulo (mod) is the remainder when 5² is divided by 7. Problem arises when a and b are fairly big, resulting a huge number for aᵇ. For example, 1013⁵⁹ has 178 digits; it would overflow most calculators. Magic Number does better but still cannot escape the fate of 1013⁵⁹⁰⁰⁰. Once overflowed, further calculation was not possible. 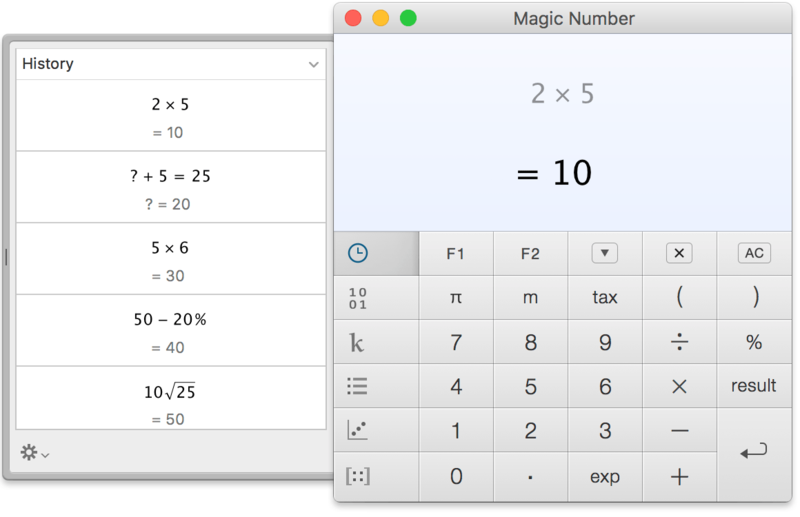 Magic Number is smarter now — it uses fast modular exponentiation. In case you are wondering, a, b, m can be 14 digits long. Calculating permutation or combination involve factorial. A simple factorial of 172 (2.31×10311) would overflow most calculators before they can calculate 10-permutations of 172. 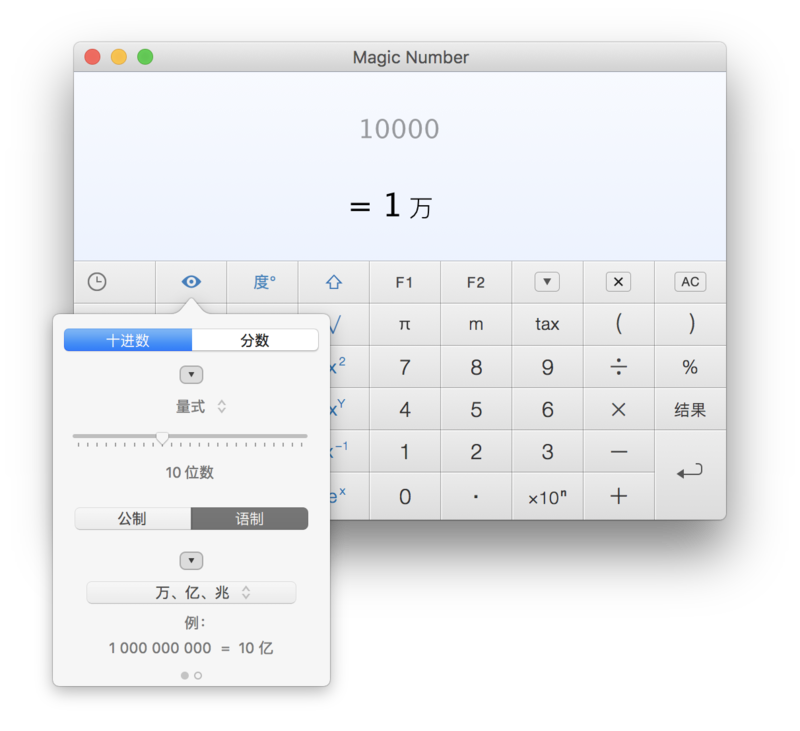 Magic Number can handle factorial up to 17243 (7.8098×1065565). Beyond that it would overflow. Previously it could not handle 10-permutations of 17300. Now it does it beautifully. Though it looks the same as before, our website has a new address: MagicNumber.app. It is more secure too. And as always, we respect your privacy. Whatever the case, it’s time for more love. by embracing the Chinese way with love. However, just as we don’t say ‘10 hundred’ for 1000, people rarely say ‘10 千’ for 10000 in Chinese. Instead, we say 1 万.
What’s more there is a separator option for digits to be grouped by 10000s. Special thanks to Alexander Kornilov for the Russian localization. Magic Number is looking awesome. Given 2 points (x₁, y₁) and (x₂, y₂), what is the equation of the line in the form of y = mx + b ? This involves finding the values for m, the slope, and b, the y-intercept. The adjacent function has a second role. What is the equation of the line that passes through (2, 2) and (6, 5)? Enter (2, 2)(6, 5) and you get 2 results. Press R to access the first result, 0.75. And twice for the second result, 0.5. Also known as the cross product. Unlike scalar product, the vector product is limited to 3-dimensional vectors. You get 3 numbers for your result; these are the coordinates of the 3D vector. You can press R repeatedly to access each result. 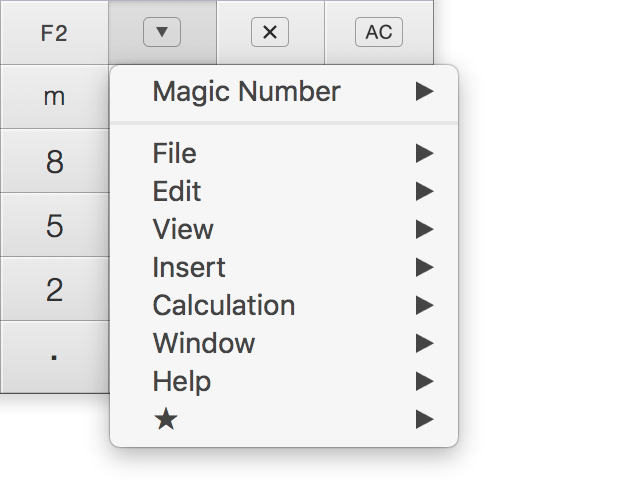 In the spirit of macOS High Sierra, we spent some time to improve Magic Number’s foundation. The journey actually began in the last update when we introduced an additional form for logarithm, log(a , b). While not groundbreaking, it is the groundwork for functions with multiple inputs or arguments. This means functions in Magic Number can be as sophisticated as those in spreadsheets and programming languages. And yet they are simpler to use. Despite the lack of true vector support, Magic Number’s new functions can support multiple arguments which work like multi-dimensional vectors. For brevity, we use 2D as examples. Also known as the dot product. Hence you use the dot ( • ) operator. The polar operator is now multi-talented. and Magic Number will calculate the angle between them. * When the radius and angle are complex, they will be also treated as vectors. Also known as the absolute value. You find it under Menu ▸ Calculation ▸ Extra Functions ▸ Complex Numbers. Before we show you the new way, let’s look at the math. Typing the formula is tedious, it’s easier to use the hypotenuse operator. the experience of using it can be better. Messy to look at and tedious to type. Now the log function looks like proper math. In Magic Number, when you don’t specify a base, say log 3, it is interpreted as the natural log of 3. 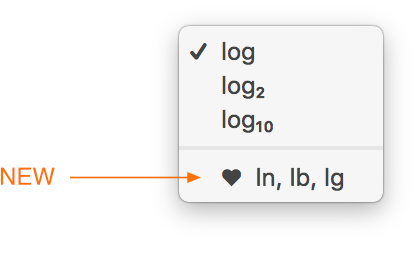 If you prefer ln for natural log and lg for base 10 log, click and hold the log button for this notation. Like HTML, the hash operator lets you enter hexadecimals. What’s more you can enter numbers in other bases too. When you press #, the base is 16 by default. Press # again to cycle through different bases. You can set a default base by pressing the # button. If a number contains hex characters (A, B, C, D etc. ), it will be interpreted as hexadecimal when pasting. Numbers with the # prefix (e.g. #339966) are interpreted as hexadecimal. Numbers with prefixes 0b, 0o, and 0x are interpreted as binary, octal, and hexadecimal. 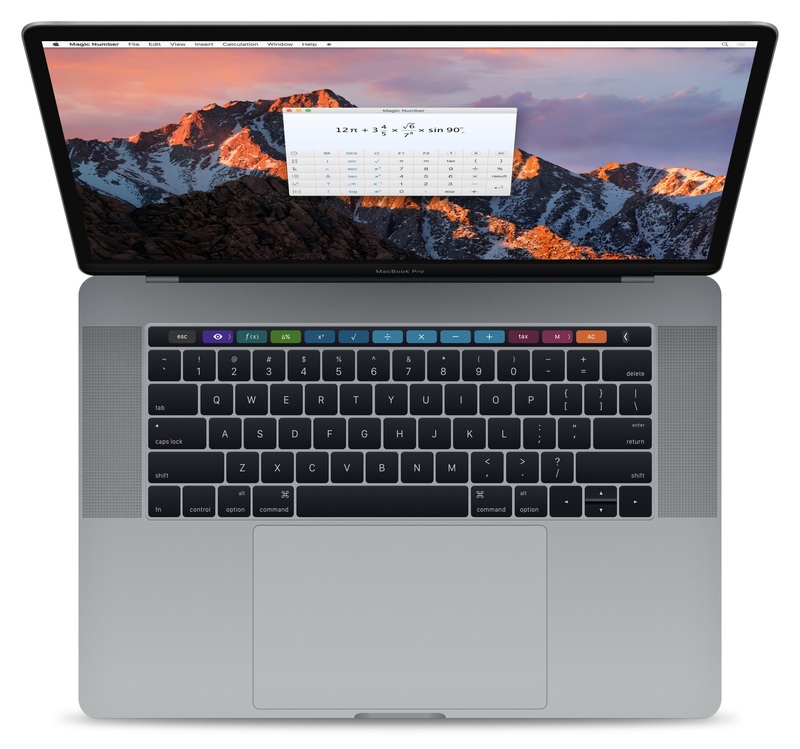 If you have a MacBook Pro with Touch Bar, this is a lovely gift for you. If you don’t, think of this as your extra Christmas present. Here’s a big number: 1 000 000 000. Scientists think of it as 10⁹. And technical people think of it as 1 G.
That’s 1 Giga as in 1 gigabyte. But billionaires don’t say I have 1 giga dollars in the bank. And we certainly don’t say there are over 7 giga people on this planet. Time to let Magic Number do the talking . This is the new Quantifier format. Enhanced from the previous SI Prefix format. By default, this format uses the metric system. Let’s have it in plain, simple language. Select Linguistic and enable Use word. Not everyone’s a billionaire. Maybe you are a millionaire. To see 1 billion in your units, press ⌥⌘< to lower the ‘scale’. Likewise to see 1 billion in terms of trillion, let’s go up a ‘scale’ by pressing ⌥⌘>. As you might have noticed, changing the scale is really shifting the exponent by 3. 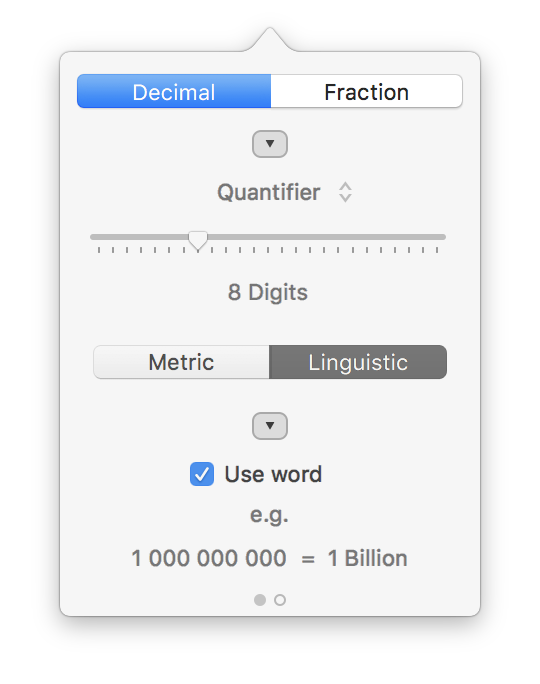 By turning off Use word you can see 1 Billion abbreviated as 1 B. To avoid confusion, here are the conventions we used. Big numbers (10³ or above) are in upper case. Small, fractional numbers (10⁻³ or below) are in lower case. Thousand and thousandth are tricky especially in English. “Thou” doesn’t look right. Thankfully K is commonly used and mil is also common for thousandth. 1 b . = 1 billionth while 1 B = 1 Billion. However, when we copy the result, other apps might have problems with it. Others might see it as separate numbers, 11, 122, 233, and 344.455. There is a new option to fix this. It allows us to copy just the pure number. As the app evolves to meet various needs, so is its complexity. In an attempt not to overwhelm new users, we put this option somewhere out of the ordinary. To access it, click and hold ⇧ . You can calculate the logarithm for any base. As usual, if you enter log 27, you get the natural log. Gamma function is related to factorial. So click and hold this button to reveal it. Something for the programmers. Click and hold % for this option. 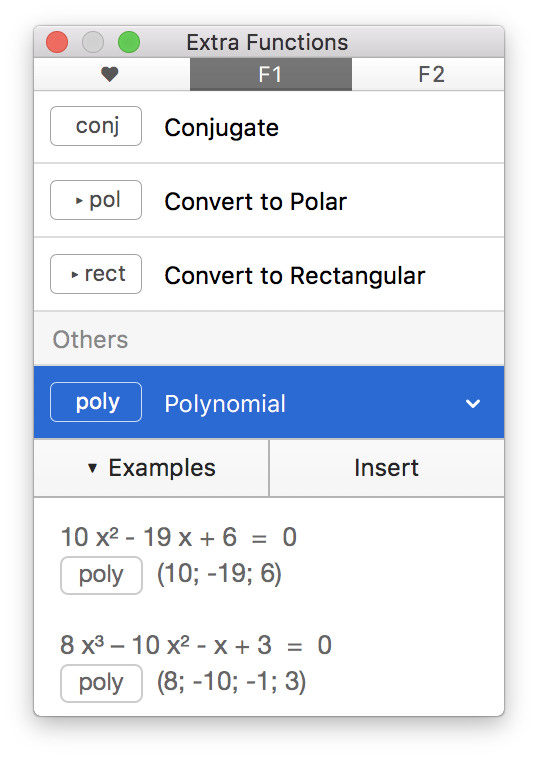 Parentheses will be inserted automatically for absolute value, argument, and many complex functions. This is particularly useful if you use many different functions. 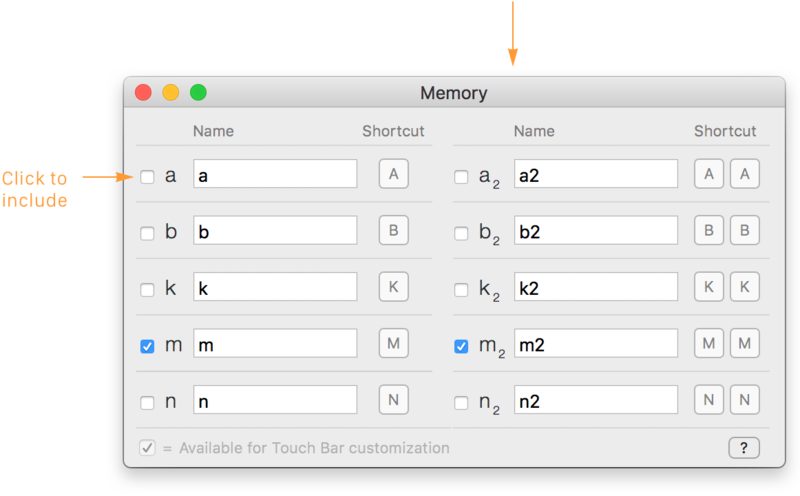 You can insert a function via keyboard. 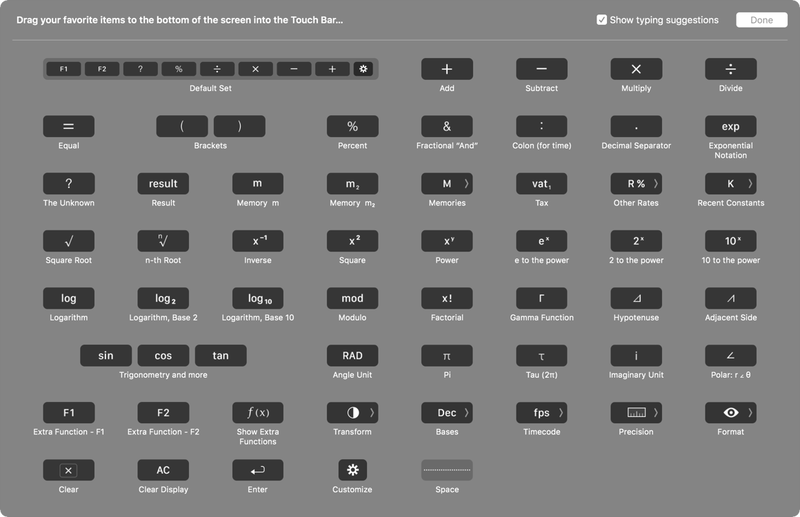 Press ⇧⌘F to open the Function Browser. Type the first few letters of the function you want. For example, type “flo” to select the floor function. Press return to insert the function. The floor function becomes your favorite function. To use it again, press ctrl-F. 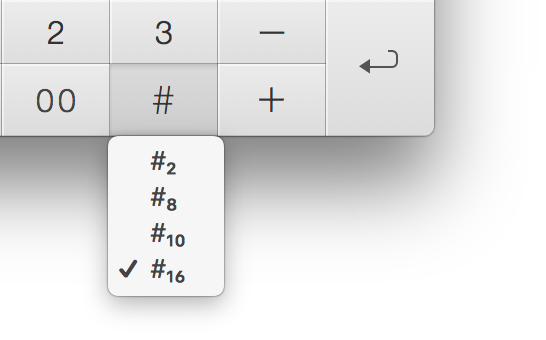 Previously if you select a function via ⇧⌘F, it will override your chosen function for F1. Now your choice is respected. 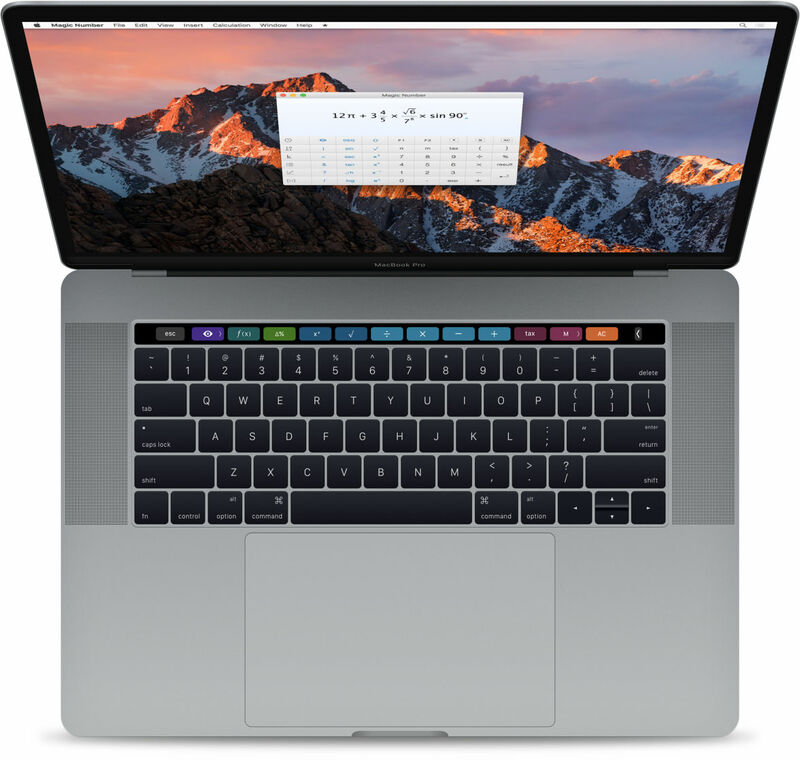 Touch Bar is a wonderful feature on the new MacBook Pro. Something we’d love to have on future Macs. Let’s look at the special buttons. You may be wondering where are the inverse and hyperbolic functions. If you don’t use hyperbolic functions, there is also a quicker way. On the surface, this button switches between degrees and radians. When you tap and hold, you get contextual options. In radians, you can see your result in terms of pi or tau. This expands into 2 parts. Part B is quite smart — it examines the context and brings you the relevant options. They are general, decimal places, scientific, and fraction. Sometimes, depending on the context of your calculation and format, you want to look at results differently. Previously you had to dig deep, now it’s one tap away. This applies to any scenario. For any calculation, you can decrease or increase the precision. You can also show or hide the separator. Result is an angle in degrees. You can see your result in degrees, minutes, and seconds. Note the icon with 2 dots on the right. Tap it to switch control. Result is an angle in radians. Make sense of radians by seeing it as a factor of π. Result is a complex number. Switch between rectangular and polar formats effortlessly. Press ⟨⟨⟨ to see 1 billion as 1000 million. Or press ⟩⟩⟩ for trillion. Engineering wise, this is shifting the exponent from 10⁹ to 10⁶. This one is good to know. It transforms a number from one form to another. a nice rating will warm our hearts. If you are familiar with Spotlight, you know you can access it anytime and anywhere — by clicking its menubar icon or by pressing its shortcut. And when you switch apps via ⌘ tab, it doesn’t get in the way. What’s more, it coexists nicely with full screen apps. You can make Magic Number behave this way. 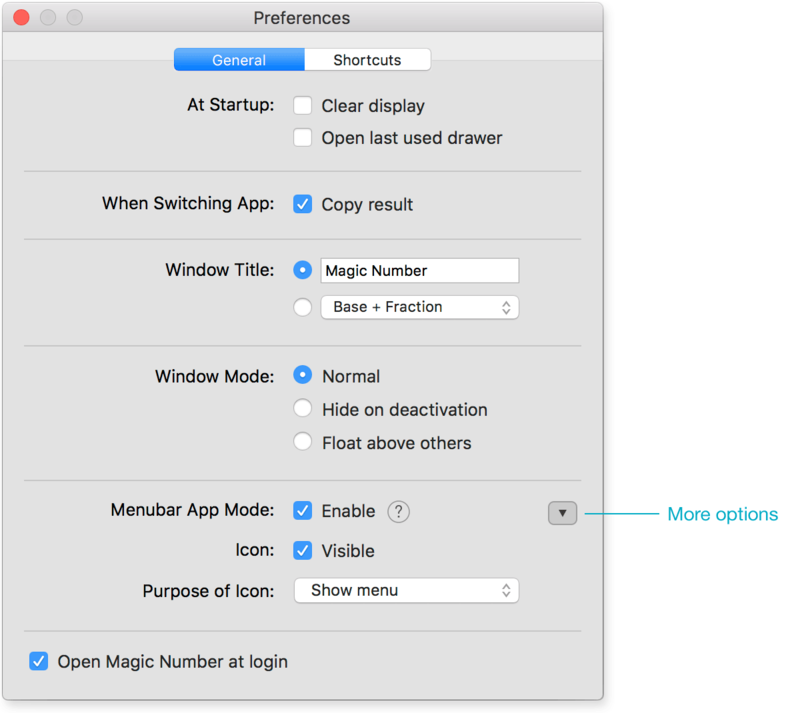 In Magic Number ▸ Preferences, click the arrow for more options. When Menubar App Mode is enabled, Magic Number resides on the menubar instead of the Dock. A quicker way to access the menu is to right-click (secondary click) the arrow button on the calculator. 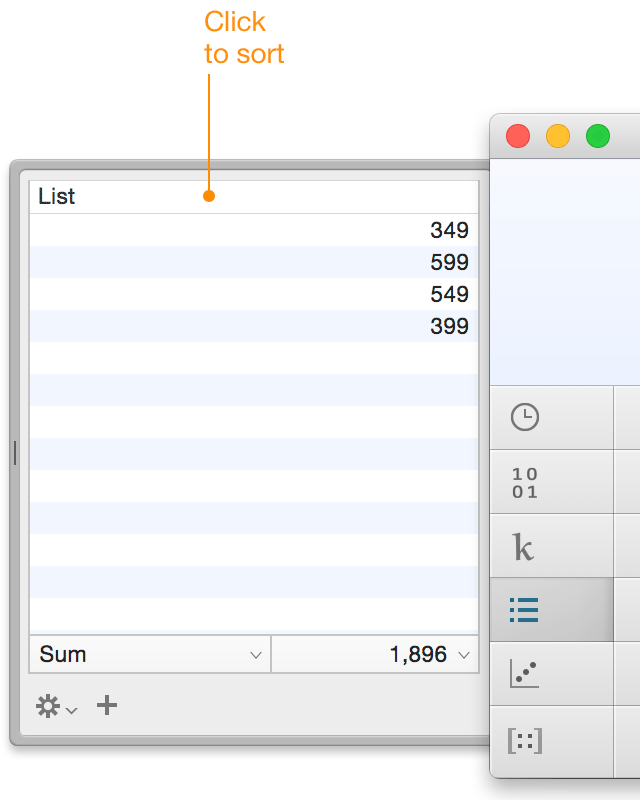 When working with a full screen app, you might want to keep Magic Number’s window on top. You do so by right-clicking its title and choose Window Mode ▸ Float Above Others. 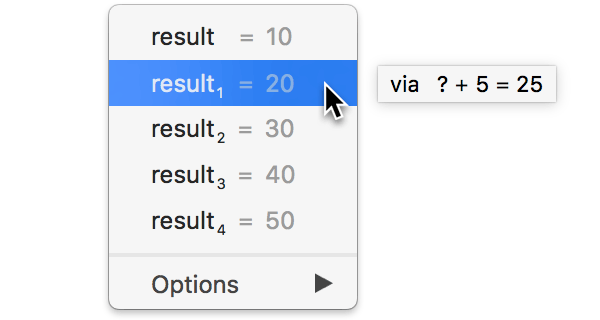 If you find yourself pressing ⌘Q when you just want to hide Magic Number, there is an option for you. Under Preferences > Shortcuts, click the arrow for more. Menu ▸ View ▸ Number Format ▸ Significant Digits. Improved compatibility with the upcoming macOS Sierra (10.12). Going forward, Magic Number now runs on 10.10 or above. And love for the time-obsessed. Video is a series of still images which, when viewed in rapid succession, creates an illusion of motion. How rapid? For films, it’s 24 images or frames per second or 24 fps. This is the frame rate of film. Suppose we are adding music to a film. The music starts at ½ second. As time format, this is 0 : 0 : 0.5. 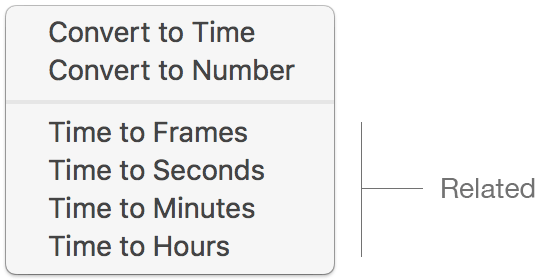 But our video app prefers timecode instead, in the form of hours : minutes : seconds : frames. We will use Magic Number to find the timecode. To see the result as timecode, select View ▸ Timecode ▸ 24 fps. As expected, ½ second equates to 12 frames. Our music is 3 minutes and 7.25 seconds long. Let’s see exactly where it ends in the film. You can think of timecode as time with the extra frame component. Dealing with 4 components can be messy. The following tips will help. To enter 6 minutes, just type 0 : 6 — no need to type 0 : 6 : 0 : 0. Also, no need to type the leading zero, just type : 6. Likewise for 6 frames, you can type : : : 6 for 0 :  0 :  0 : 6.
it can be 0.5 second for 24 fps or 0.4 second for 30 fps. 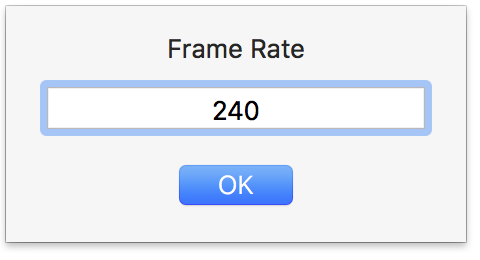 To see what frame rate you’re using, press ⌥⌘. (option-command dot) . To see the frame rate permanently, right-click (secondary-click) the window’s title. The menu None ↔︎ Recent fps (⌥⌘:) switches between no frame rates and your most recently used frame rate. It’s a quick way to turn timecode on or off. Slow motion requires shooting at high frame rates. The iPhone can do 240 fps. While impressive, some do it 10 times better. And few do it insanely well. It’s good to know that there is a customizable frame rate. Suppose we have 1 minute 25 seconds of video at 240 fps. When exporting it as images, how many images do we get? Before we do any calculation, let’s establish the frame rate. Go to View ▸ Timecode ▸ Customize* and enter 240 for frame rate. Normally you would calculate how many seconds in 0:1:25. Then you multiply the result by 240. There is a better way. How about a Time to Frames function? Better still, how about a new set of time conversion functions? This leads us to the next topic. How many minutes in 1:20:30? And how many seconds are there? Time to Minutes and Time to Seconds can give you the answers. They are parts of the time conversion family. You can find them under Calculation ▸ Extra Functions ▸ Time. Notice Magic Number automatically encloses 1 : 20 : 30 in parentheses to avoid ambiguity. How many seconds in 1:20:30? Sometimes it’s easier to think of time as duration. For 180 minutes, it’s perfectly fine to type 0 : 180. What is 36 million seconds (36×106) in hours? You may be wondering is there a Minutes to Time function. There isn’t one. Because Magic Number can do it automatically. For 4830 seconds, type 0 : 0 : 4830. For 2.5 hours, type 2.5 : 0. When a number has colon ‘ : ’ as in ‘2.5 : 0’, you are letting Magic Number know you want the result as time. As usual, you can assign these functions to F1 and F2. You can fit 4 functions under 1 button. Let’s say F1 is assigned to Time to Frames. By pressing F1 repeatedly you cycle through its related functions. If F1 and F2 are occupied, the following recent function will help. you can use it again by pressing control-F (⌃F) . The screenshot shows Modulo is the recently used function. To use Modulo again, press ⌃F. Quotient is related to Modulo (as indicated by the menu). To use Quotient, press ⌃F ⌃F. You can use the same technique for F1 and F2. That is, press F1 twice for its related function. Learn more here. There are other small yet nice refinements to Extra Functions. Check out the next topic. 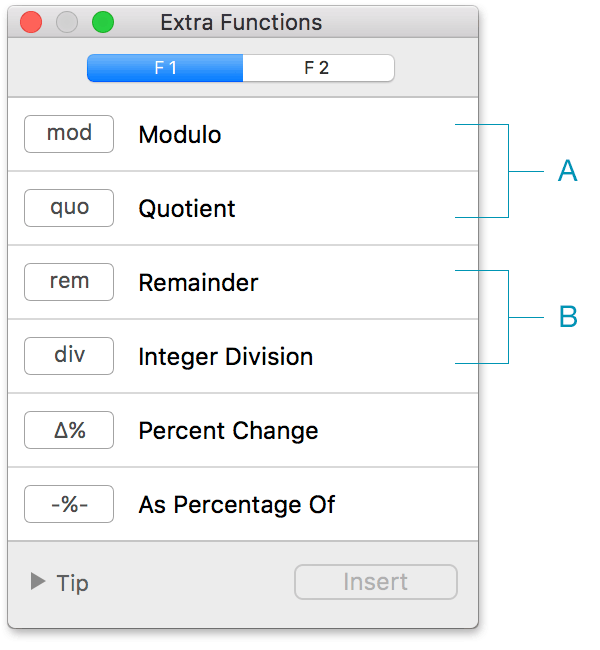 Like the Extra Functions menu, the function browser (⇧⌘F) is also organized by categories. Its buttons are bigger, examples are easier to read and the design is more in line with the latest OS X. Option for a more unbiased Round function. This the IEEE 754 default method (also known as half-to-even or banker’s rounding). To use it, open the function browser (⇧⌘F), scroll to Round and click the arrow. Fixed an obscure bug related to editing around the square root. Fixed a compatibility issue with OS X 10.7. It’s natural to type ‘11 + 33 / 2’. it bonds 33 and 2. As a workaround, we use parentheses, ( 11 + 33 ) / 2. While workable, it’s also unnatural and slows us down. Ideally we want ‘+’ to act upon 11 and 33. We want it to bond 11 and 33. We want it to be sticky. Or rather, ⌥ is the sticky key. 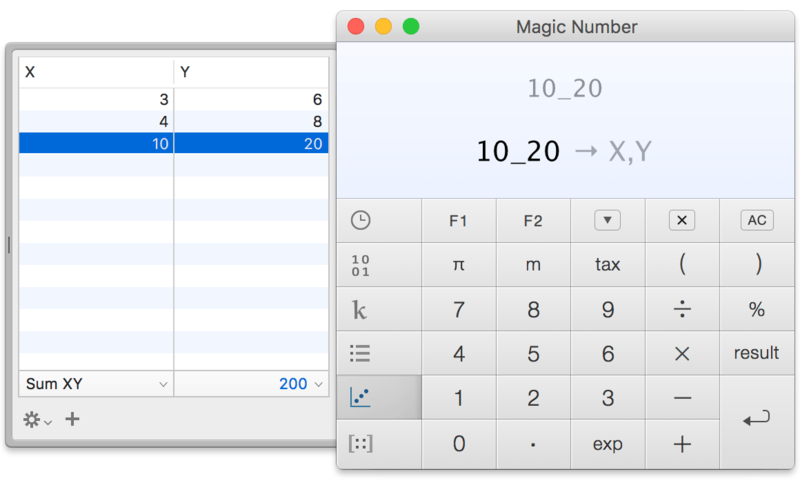 and the upper-case X, Magic Number uses the dot ( • ) notation from math. you had to use parentheses, 8 ^ (2 / 3). And now, 8 ^ 2 ⌥ / 3. You are 5 minutes away from being an expert. These 2 tips will give you the edge. Magic Number now preserves your drawer selections. More optimization, less cruft, and cleaner code. As the result, OS X 10.7 (Lion) is no longer supported. Fixed rounding errors with arctangent in radians. Fixed a rare error in converting radians to degrees. Previously when you press R, you get the most recent result. Now you can press R repeatedly for 5 most recent results. Here is a quick illustration. The most recent result is 10. You press R to insert it. If you press R again, you get the next result, 20. And so on… until you reach the 5th one, 50. Another press will take you back to the first result. It now has a new menu — click and hold to reveal it. It lets you see and insert results without opening History. To see the expression, just hover your mouse over it. You may have noticed, as you press R successively, Magic Number flashes the name of the result. Besides name, you can see the expression. You can turn off flashing with “Do Not Flash”. You can still see the detail by pressing ⌘I (that’s the shortcut for Inspect). Besides bug fixes, this update improves reliability. This is the Roman numeral for one hundred and twenty three. It’s shorter than words, but not as easy as 123. What’s more, it’s awkward for math. Our numeral system began with whole numbers. Fractions were added later. The number 123.4 has 123 as the whole part and 4 as the fractional part; both separated by the decimal separator. (That’s the dot. Comma is also popular in many countries.) The notation means 123 + 4/10. Mathematicians could have invented a different notation like 123 + 4 f.
Here f is 1/10. Overall it’s shorter than 123 + 4/10. It’s a step forward. For fun, let's do some math. Let's calculate 100 × 123.4… oh I mean 100 × 123 + 4f. But wait… multiplication has higher precedence than addition. We really have to bracket 123 + 4 f.
Let’s subtract, 200 – 123.4. Again we need those parentheses. The list goes on. It’s a parenthesizing nightmare. Complex number also has 2 parts, just like 123.4. Its format, x + y i, while informative, is also cumbersome. Just as we have decimal separator, we can devise a complex separator for complex numbers. The question is, what symbol should we use? In the spirit of decimal separator, the symbol has to be easy to type and easy on the eyes (compare 8.88 with 8&88). More importantly, it has to be distinctive from other math symbols. In writing, we use hyphens to join related words, for example, two-dimensional, full-length. Unfortunately hyphens look too similar to subtraction. In computing, underscores are commonly used for the same job, for example, full_length. Furthermore, they don’t conflict with math. There you have it. Underscore is it. Simple notation makes complex numbers more approachable as 2D numbers. Whether it is x and y or width and height, anyone can benefit. Read on. Let’s enlarge a 16 by 9 photo 400%. To calculate the new dimension, you do the same math twice: 16 × 4 and 9 × 4. As 16 by 9 is two-dimensional, let’s use a ‘2D’ number, 16 _ 9. This number is actually a complex number, usually written as 16 + 9 i, but for convenience, we use Magic Number’s simple notation, x _ y. If math is not your subject, don’t let the word complex deter you. Remember our math evolves over time. First we had whole numbers (1, 2, 3) and later fractions. Early humans probably think 1 ½ is complex. Numbers can have two parts. That is, they can be two-dimensional. Everyday numbers have one part — the real part, represented horizontally. The vertical or the imaginary part emerges under special circumstances. Note also negative numbers were once thought as ‘imaginary’ as people could not imagine having less than nothing. But if the subject is money, negative would mean debt. Likewise, the imaginary part has significance in many subjects. The nice thing is, for 2D arithmetic and geometry, you don’t have to understand the imaginary part. Just use it as the vertical dimension. If you want to learn more, go to BetterExplained for the wonderful articles on imaginary and complex numbers. We’ve learned a lot there. Last but not least, check out Wikipedia. Enter: 16 _ 9 × 4. Let’s say you shoot videos in 4k (3840 by 2160) and you often need resolutions for various scales. As we use this master resolution a lot, let’s set it to m.
What’s the resolution at 50%? Let’s make it 4 times smaller. What is the distance between (7, 5) and (3, 2)? Not quite the result as it is the horizontal and vertical distances. We want the direct distance as shown by the blue line. We can use Pythagorean theorem. But it’s quicker to see the result in polar coordinates. As 2D is based on complex numbers, Magic Number uses the star symbol ( * ) for scalar multiplication. To get it, press multiply twice, that is, ××. To calculate (1, 2) • (3, 4), enter 1 _ 2 ×× 3 _ 4. However finding θ involves lots of ugly labor. There is a quicker way via the polar button ( shortcut: < ). If you press it twice, you get the vector angle operator. To calculate the angle between (1, 2) and (3, 4), enter 1 _ 2 << 3 _ 4. 2D-List is now easier for storing and reusing complex numbers. Here is a complex number. Notice the parts are splitted and stored under X and Y. This gives you more flexibility. For example, you can sort by X.
where you can choose what to insert. If you use X for width and Y for height, then XY is the area. The screenshot shows the area of a selected row. Another non-2D use: X as the quantity and Y as the price. 2D-List can split a complex number. The new ‘Part’ function can do this too. It does so without populating your list. It’s easy and versatile. Check it out. These functions are under Calculation ▸ Extra Functions, towards the end. The part function lets you pick the real and imaginary part. If the complex number is in polar, you can pick the absolute value (magnitude) and the argument (angle). As the part function is used for complex numbers, for convenience and clarity, Magic Number inserts parentheses if needed. Complex numbers have the forms a ± b i, a_b, r ∠ θ. But our needs and habits vary. For example, a + i b and b i + a are both valid. Therefore Magic Number takes a less strict approach, it will auto bracket something ± something, something_something, and something ∠ something. Give it a try. It works well for most cases. If you prefer to bracket manually, it’s good to know these tips. Previously if you want to see the result in polar, you need to switch to polar view by pressing ⌥⌘P. You now have dedicated functions. There’s no need to switch views. These functions also have auto bracketing. Here is the full story behind the change. Let’s look at simple division like 7 ÷ 3. If we want integer result, the answer (quotient) is 2 and the remainder (modulo) is 1. In Magic Number, you can calculate modulo and quotient with mod and quo. But when we have negative number, as in –7 mod 3, there are two possibilities. We are dividing by a positive 3. The modulo should be positive too. The modulo should have the same sign as –7. It should be negative. B is used in popular programming languages like C, Java, and PHP. As early users of modulo were mostly programmers, Magic Number opted for B. A, being based on Euclidean division, is a better suited for math. It is used in spreadsheets, Mathematica, and languages like Haskell and R.
Excel and Numbers use A for modulo, but (sadly) B for quotient. For math and new users, Magic Number now uses A. You are taken care of. You get the ‘new’ functions Remainder and Integer Division. They use B for modulo and quotient. Factorial is 20–200% faster for big numbers. This in turn makes combination and permutation faster. Also cool: factorial can handle floating-point numbers. Fixed a rounding issue with complex numbers. Fixed a rare crash that occurs during startup. Fixed a cosmetic issue in Preferences under OS X El Capitan. Fixed an issue where the shortcut ^ does not work on some keyboards. Improved compatibility with OS X El Capitan. Engineering-wise, Magic Number is more streamlined and optimized. We start with the U.S. where prices are exclusive of tax. ‘399 + 749’ is actually the sum of an Apple Watch and an iPhone. calculation like ‘(399 + 749) + tax’. Now you can do it with one click. You can use History to quickly look at the effect of tax. Our examples show tax for one calculation, but you are not limited to one. 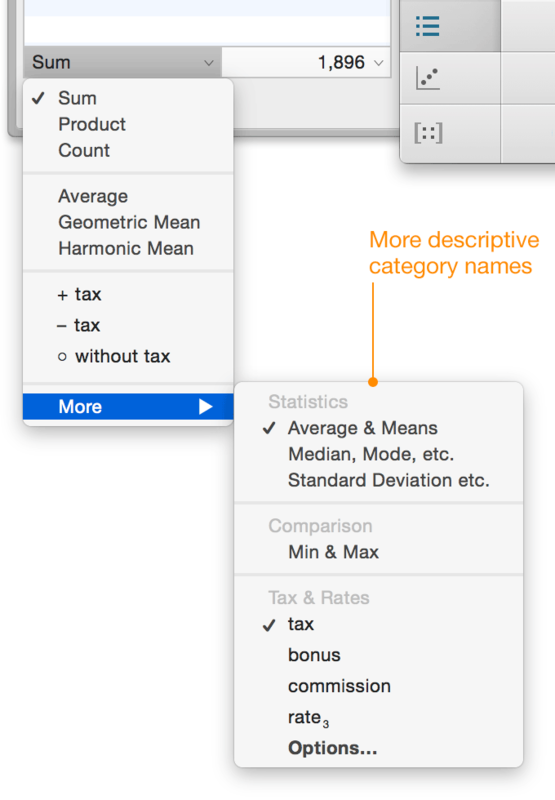 When you use a tax function, your result is automatically shown in currency format (2 decimal places). You can click the table heading to sort the list. In addition to List, you can also sort 2D-List and Matrix. With more functions, we have to reorganize them for the better. 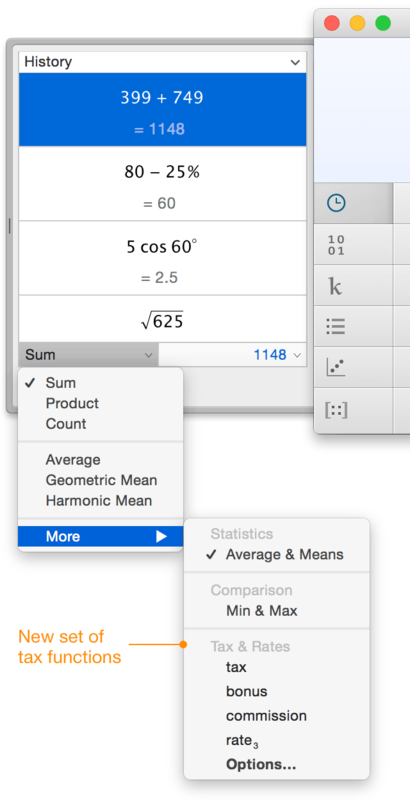 In case you missed it, the functions we recently added are product, geometric mean, harmonic mean, and the population functions for Standard Deviation etc. We obsess every detail — from design to workflow. And you get a better app in every possible way. You spend most of your time looking at expressions. As display resolution improves, it’s time for us to improve what you see. Even on a non-retina display, you can still notice the layout improvements. 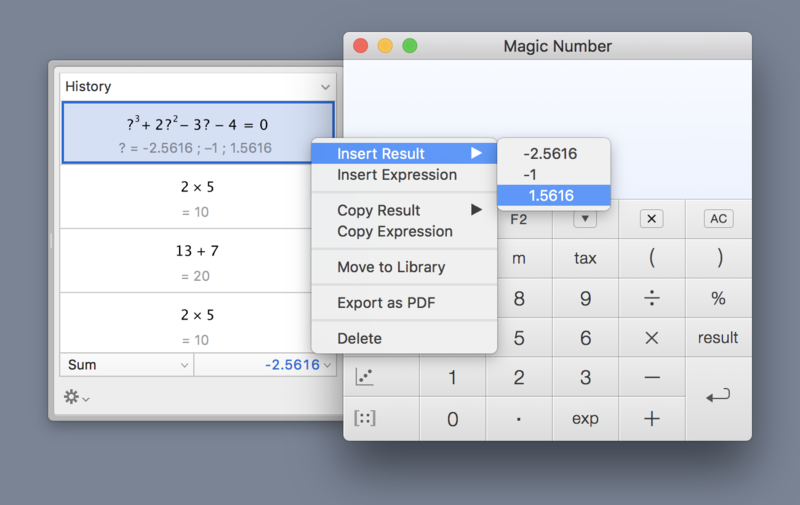 And if you use Magic Number as an equation editor, you get nicer PDFs. More distinctive π and τ. Better layout for n-th root. Improved layout for subscripts and superscripts. We can use them in everyday life too. They make memory and tax names more compact, yet informative. If the name ends with a number, you get subscript automatically. You can also specify in the form of ‘name_subscript’. The underscore ‘_’ acts as a separator. prefix it with ‘_’ so that it becomes ‘_tax_USA’. Working with scientific constants is easier with the new Constants drawer. Click to sort constants by name. Click again to sort by symbols. 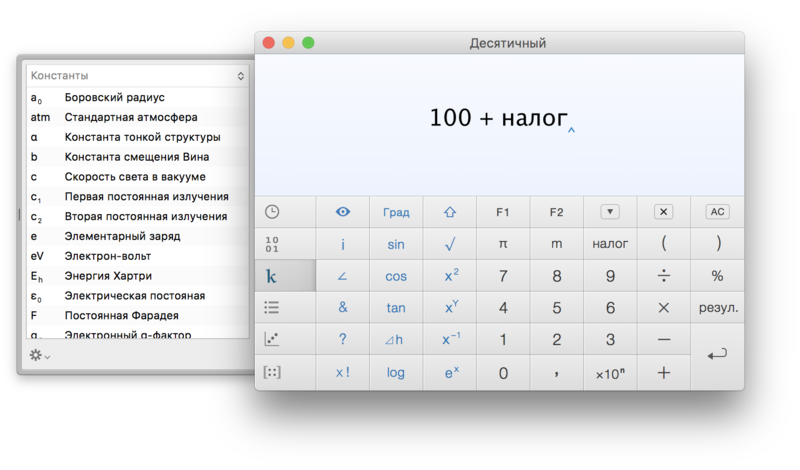 If you want see the constant’s value quickly, press ⌘i. Press ⌃K (ctrl-K) to insert the most recent constant (Standard gravity) . Press again to insert the next recent one (Electron volt) . You can look up constants on Wikipedia. You can see constant names with units. To cycle through the recent constant in reverse, press ⇧⌃K. 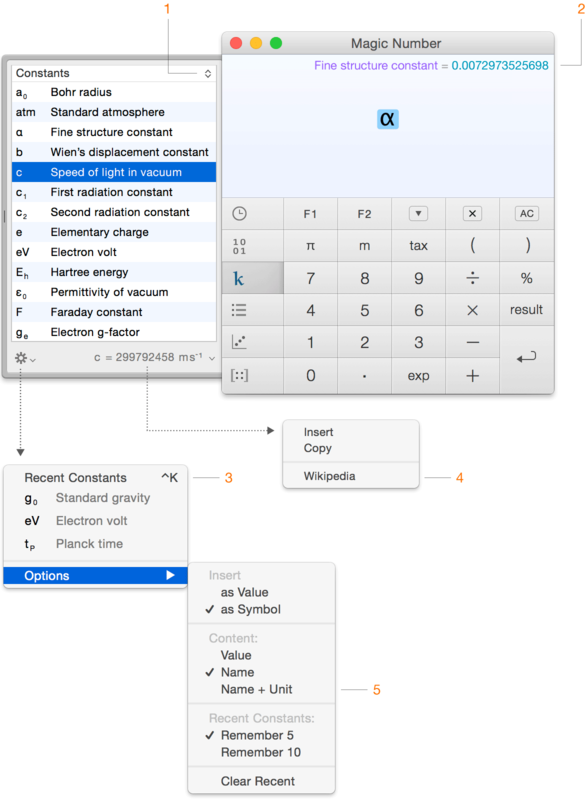 Constants are also listed under the new Insert menu. The sorting and content are also dictated by 1 and 5. You can search constants by pressing ⇧⌘/. Last but not least, the constants are updated with the latest CODATA recommended values. Here are some tips if you want to learn more. In brief, custom key let you use an ‘alpha’ key as a shortcut for a button. Technically you can use any ‘character’ based key. The above uses ‘\’ for ‘÷’. Another example, ⇧2 for x². If you like, you can also use ⌥2. ‘Esc’ is the only non-character key you can use. 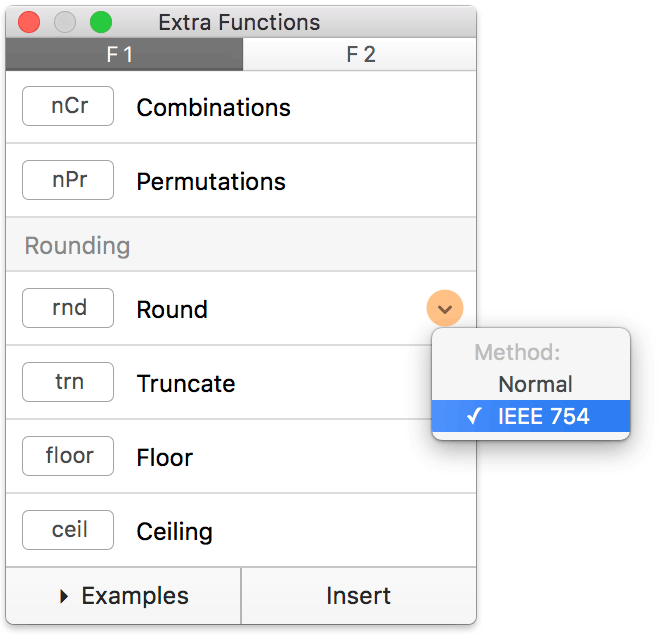 ‘Esc’ for ‘clear’ is a shortcut on Apple’s calculator. If you are a Spotlight fan, you can use ‘esc’ for ‘hide’. * Note: it’s the lower case ‘p’. If you use capital ‘P’, you need to press ⇧. 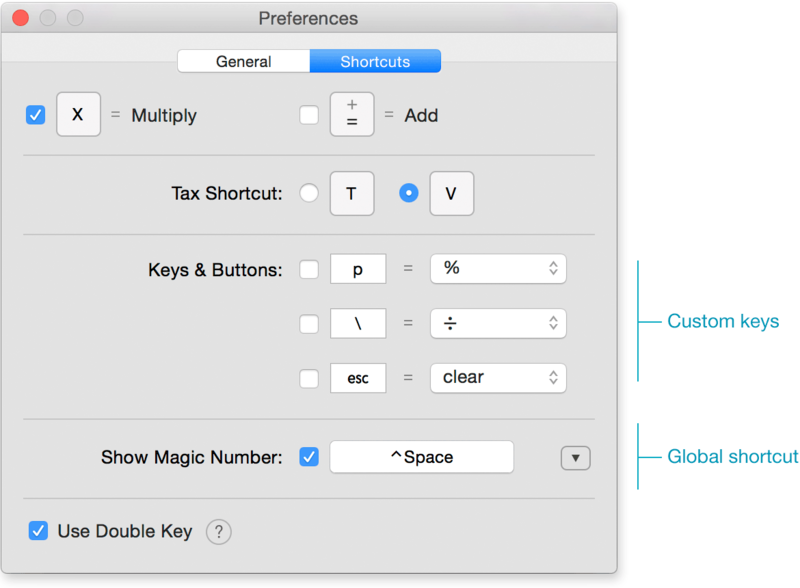 Global shortcut lets you switch to Magic Number from any app. The default shortcut is control-space. You can easily change this. When you press again, it hides Magic Number. You can customize this ‘press again’ behavior too. Here are some useful tips on customizations. In text, when you double-click, you select a word. 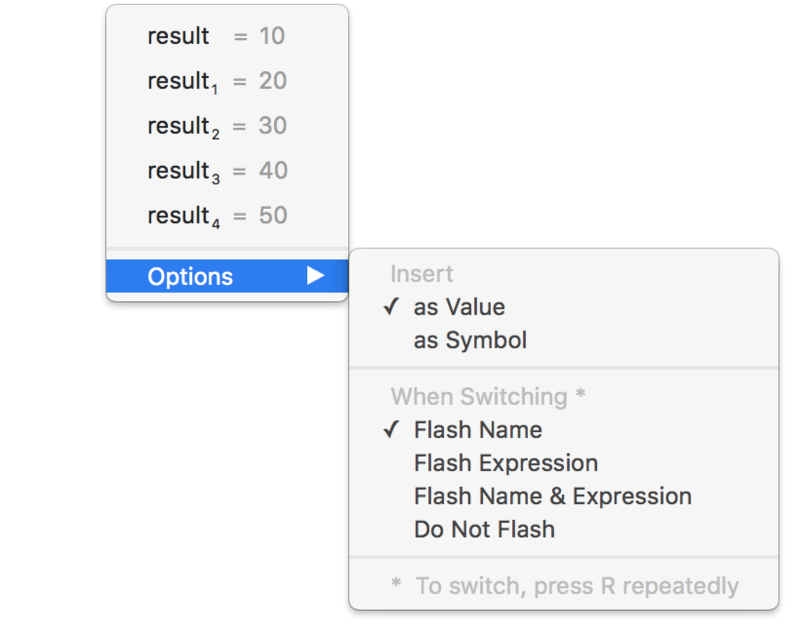 What about double-clicking an expression? You can say a word is a just group of related letters. An expression is similar; it’s made of groups of related elements. The most obvious kind of group is the bracket (parenthesis) . It literally groups elements together. To select it as a group, double-click either ( or ). You can also press ⌘G. Like editing text, it’s easier to double-click to select a word. In Magic Number, double-clicking is faster and more intelligent. how the elements are grouped. Therefore it can offer meaningful selection. Mathematically 2 + ( 3 × 4 ) is equivalent to 2 + 3 × 4. They yield the same result. The higher precedence of multiplication bonds with 3 and 4 to form a group. So operator is a group. This includes √ and functions like sine. Tip: You can double-click a member to select its group. For example double-click 3 to select the whole fraction. The ‘+’ operator is also a group. It consists of 2 and the group 3 ÷ 4. So an expression is just a group of groups. You can also think of a group as a sub-expression. Press ⇧⌘A to deselect. Then click 3 sucessively for 4 times. Notice how each successive click selects the parent group. You can delete it as a whole. You can replace it with a new value. You can inspect your selection. You can bracket your selection. We will talk about the last two. You can see the value of your selection. You can simply select ‘+’, press ⌘I, Magic Number will automatically select its group and show you the value. 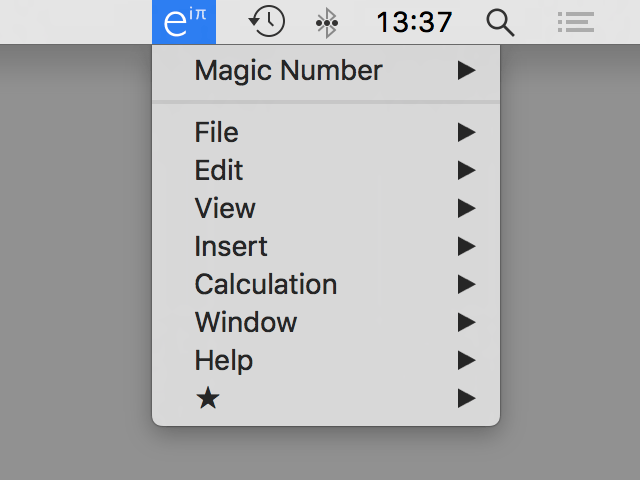 Notice Magic Number automatically selects ‘tax’ because it is near the cursor. Once you have your selection, you can bracket it. Notice the cursor ( ) is at the right of the bracket. This makes it handy to insert more at the right, e.g. What if you want to make it √ ( 82 + 152 ), i.e. you want to insert at the left. As you might have guessed, there is a left-biased shortcut. Whether you use the left or right-biased shortcut, the cursor is always outside the bracket. This makes sense because you want to do something to the group, such as dividing by 2 or taking the square root. When your selection is just a number, the cursor will be inside. The top reason for bracketing a number is to combine it with other element to form a group. Here is an example. First select the number 5. Press ⌘ ] to bracket it. To finish, we enter ‘+ 6’. The status is now clearer and easier to read. Speaking of history, the days of exporting one PDF at a time is over. ⌃ ↩ control-return Insert an item to the display. Fixed a crash that occurs when a decimal point is inserted in a certain way. Fixed an issue where the memory did not retain a value’s format. Fixed various cosmetic glitches in Yosemite.